Like fresh mint leaves newly picked straight from the garden. 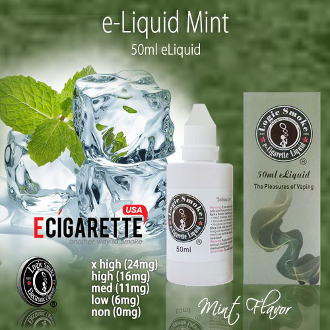 The refreshing taste of Logic Smoke mint e-liquid can brighten any day and give an invigorating, refreshing vaping experience. Vape it alone or add a few drops to one of our other Logic Smoke e-liquid flavors such as blueberry, peach, lemon, green or black tea. Or jazz up the chocolate or white chocolate e-liquid for a refreshing after-dinner mint taste. With the perfect blend of an 80/20 PG/VG mix (propylene glycol and vegetable glycerin (organic, food grade preservative compounds), you'll get the best flavor concentration along with the perfect amount of vapor to satisfy your vaping needs. The 50ml bottle is a convenient and economical size for purchasing in quantity. Fill your clearomizer or other e-liquid atomizing device directly from the bottle or use it to refill your smaller travel-size e-liquid bottles. You'll be ready and have liquid on-the-go at any time.